To date the MATEN is my absolute favorite 308 AR Lower/Upper. Fit finish and style that are unsurpassed. 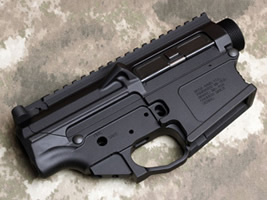 The MEGA ARMS MATEN billet receiver set will accept ALL DPMS & Knight Armament parts. All Armalite parts with the exception of the barrel nut, and magazine. Build your ultimate hunting, tactical or target rifle without having to compromise. The MEGA ARMS MATEN will be sold only in sets (upper and lower) including a charging handle, threaded bolt catch pin, take down pins, tensioning screw, and door. This was done to guarantee the best possible upper to lower fit and finish. Using the MEGA ARMS MATEN platform also allows you the most options on your next build. • The Mega Arms MATEN upper and lower receivers accept the widest variety of .308 components on the market. 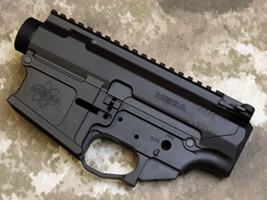 • Included in this new platform: upper receiver, lower receiver, billet charging handle, threaded bolt catch pin, take down pins, dust cover door & upper receiver tensioning screw. • Our billet upper & lower have been designed to be the most versatile and compatible platform available. A truly unique look and flawless function is what you should expect. • We know you will rely on your new weapon like a tool, and that’s what you will get when using the Mega Arms MATEN. Strong & light weight, you can build your next rifle with the best of both worlds. • Priced lower than most competitor’s forged sets. 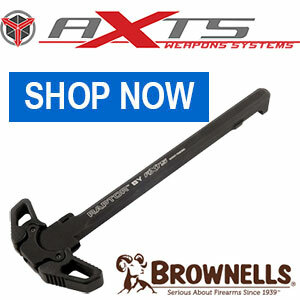 • Billet charging handle features an anti-slip surface for improved grip.